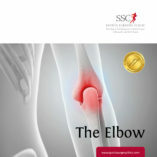 The Elbow - How elbow pain and injuries are treated at SSC. 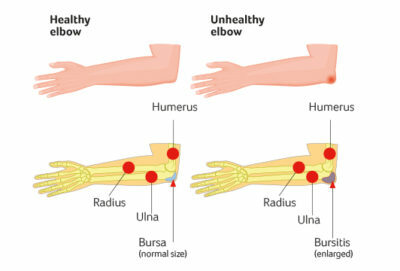 The elbow is the link between the arm and the hand and wrist. It allows you to place your hand in many positions, allowing you to brush your hair, scratch your back, feed and wash yourself. The elbow plays a fundamental role in all actions involving the upper limb including reaching, lifting, carrying and throwing motions. 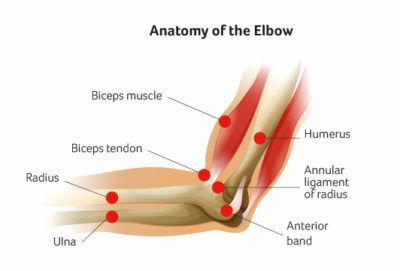 Elbow pain can result from a number of factors including fractures (bone injury), ligament and tendon problems (soft tissue injury), and degeneration due to previous injury, manual work, inflammatory conditions and/or aging. The elbow is a complex hinge joint formed from the end of the humerus in the upper arm and the top of the ulna and radius in the forearm. 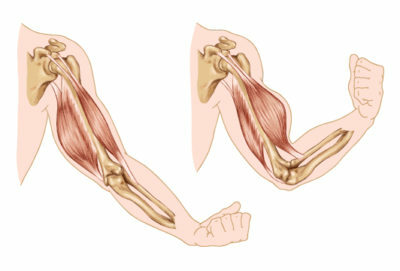 The elbow allows flexion and extension of the forearm relative to the upper arm, and rotation of the forearm and wrist. The arch of bone at the end of the humerus is made up of the medial epicondyle on the inside and the lateral epicondyle on the outside of the elbow. The tendons of the forearm muscles attach to these epicondyles. Inside the bony arch is the capitellum which articulates with the top of the radius and the trochlea around which the olecranon of the ulna bone moves. A layer of smooth articular cartilage covers the ends of thebones forming the elbow joint. The joint capsule has a thin lining of synovium to provide lubrication to the elbow allowing smooth motion. The bony configuration of the elbow gives it stability that is assisted by an extensive network of ligaments and tendons. 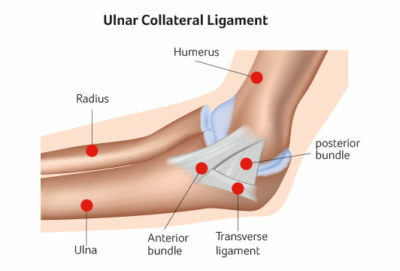 The medial (inside) and lateral (outside) collateral ligaments attach and maintain the position of the radius and ulna relative to the epicondyles of the humerus. These ligaments allow various movements of the elbow while resisting dislocation of the joint. At the front of the elbow, the end of the biceps tendon passes over the joint and attaches to the radius allowing supination (rotation) and flexion of the forearm relative to the humerus. At the back of the elbow the triceps crosses the joint and controls extension. The olecranon bursa is at the posterior tip and is a sac-like membrane which cushions the tip of the elbow and helps smooth movement of the joint. 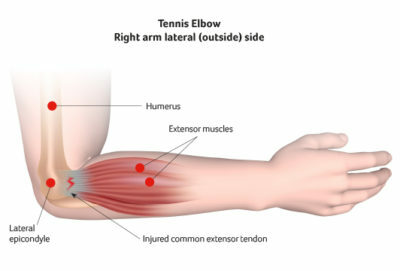 “Tennis elbow” or Lateral Epicondylitis causes pain over the outside of the elbow. It is not only caused by racquet sports but can occur with any activity where repeated twisting and extension of the wrist is required. The condition can be caused by degeneration or tears of the tendons attaching to the lateral (outside) epicondyle. Similarly, “Golfer’s elbow” or Medial Epicondylitis is caused by problems with the tendons attaching to the medial (inside) epicondyle. Treatment often involves a combination of physiotherapy, bracing and steroid and/or Platelet-rich Plasma (PrP) injections. Surgery may sometimes be required. Prevention programmes focused on warm-up stretches, and equipment changes such as racquet grip sizing are important. Olecranon Bursitis or “Popeye Elbow” causes swelling and redness of the posterior tip of the elbow. Bursitis can be caused acutely by falling on the tip of the elbow or by repetitive leaning the tip of the elbow on a hard surface. It has been associated with repetitive motion in golf and racquet sports, and inflammatory conditions such as gout and rheumatoid arthritis. Many patients may have a bone spur or “enthesophyte” at the tip causing further irritation of the sac-like bursa. As the bursa becomes inflamed it secretes extra fluid within its closed cavity. Rest, anti -inflammatory medications and antibiotics (if infected) are required. Patients who develop recurrent problems need surgery to have the bursa and the bone spur removed. 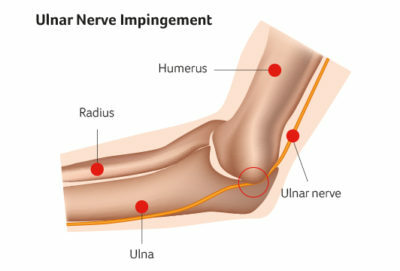 Cubital Tunnel Syndrome is caused by entrapment of the ulnar nerve on the inside of the elbow. Patients may describe “pins and needles” from the inside of their elbow travelling down to the ring and little fingers. As the compression on the nerve gets worse or is prolonged, the patient may notice wasting of the inside of the forearm or the back of the hand. After appropriate investigations, your surgeon may advise surgical release of the nerve behind the elbow. 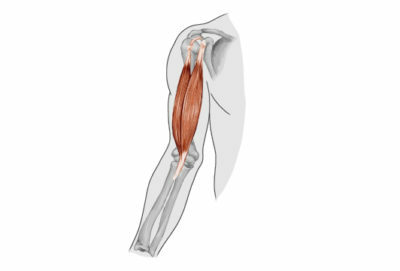 Ruptures of the lower attachment of the biceps muscle are usually seen in heavy lifting athletes, such as bodybuilders, and manual workers. It occurs most commonly in men over 35 year of age. The tendon ruptures with a very strong contraction of the biceps muscle. Patients describe a “pop” at the front of the elbow followed by pain and bruising. The muscle can retract upwards into the arm resulting in the “Popeye” sign. Without surgical repair, patients describe weakness of the elbow and forearm causing difficulty twisting a screwdriver, turning a key and lifting weights. Damage to the ligaments around the elbow can cause instability. This can occur following a fracture or in people involved in throwing activities. Long term problems with elbow instability can cause increased wear inside the joint and repair or reconstruction of the ligaments may be recommended. This is usually done by an open procedure and depends on the needs of the patient e.g. the sport they play, their age and other considerations. Fractures can occur following a fall causing bone injury alone or with joint displacement and ligament damage. 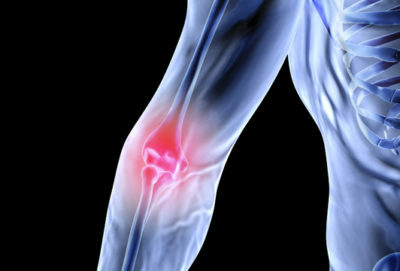 Osteoarthritis and Rheumatoid Arthritis can damage the elbow joint and surrounding structures. They can cause damage to the articular surface of the joint. “Locking” of the elbow joint can occur if fragments of bone break off the elbow and become lodged between the moving parts of the joint, causing reduced movement and pain. Synovitis or inflammation of the lining of the elbow joint is seen with both conditions. Arthroscopic or key-hole surgery can wash out the joint and allow your surgeon to remove loose pieces of bone with small instruments. Synovitis of the lining of the elbow joint can be shaved away to give pain relief and increased movement. Elbow replacement is recommended for patients with painful elbows who have failed to respond to other treatments. This choice of treatment is tailored to each individual patient and need detailed discussion with your surgeon. Your medical history to gather information regarding current complaints, symptoms, pain and effect on your activities; previous injuries; previous treatments with medications or surgery. Physical examination to assess any swelling, tenderness, range of motion, weakness, instability and/or deformity of the elbow. 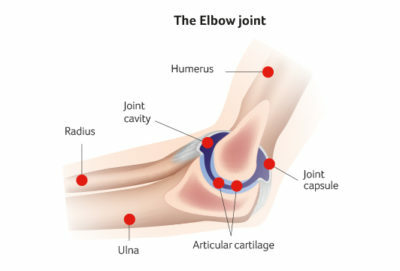 Diagnostic tests, such as x-rays of the elbow and forearm; Magnetic resonance imaging (MRI) may be useful in assess soft tissues of the elbow; Computed tomography (CT) scan is used to assess the bony parts of the elbow. Arthroscopic or “key-hole” surgery is where your surgeon inserts a thin, pencil sized camera with a lens and lighting system, into your elbow joint through small incisions. The camera captures images that are viewed on a TV monitor allowing the surgeon to make a diagnosis. Using other arthroscopic instruments, repairs can be carried out depending on what is required. Open surgery may be necessary depending on the cause of your elbow problem. Incisions of varying lengths and locations are made to facilitate the open surgery based on the specific procedure. Recovery and rehabilitation is related to the type of surgery performed inside the elbow and should be closely followed in consultation with your orthopaedic surgeon and chartered physiotherapist/occupational therapist.